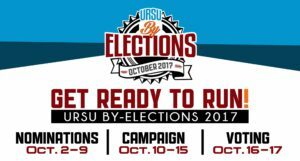 Have a say in the future of your Students’ Union by running or voting in the URSU Fall 2017 By-Elections! Take on the job of continuing to steer your SU in a productive and effective direction by making sure the voices of students are heard! Already got a job and a whole load of classes? You can still represent students and help your fellow URSU members on our Board of Directors or University Council. The time commitment is less but the insight you gain will enhance your education and the input you give can enhance the university experience of others at the U of R, its Federated Colleges and its Satellite Campuses. • If you are a Campion student in the Faculty of Arts, vote for the Campion Director AND the Arts Director. • If you are a Graduate student through Campion College in the Faculty of Arts, vote for the Grad Director, Campion Director, AND Faculty of Arts Director. 1. Login using your Student ID # and PIN. 3. Fill in ALL the answers to the Ballot questions (that you are eligible for). 4. Click “Survey Complete” to submit your ballot. • The All Candidates’ URSU Q&A and the All Candidates’ Meeting are for those who are nominated and become candidates. • The All Candidates’ Forum is for all candidates and for any student who wishes to ask a candidate a question or hear a candidate’s platform. Nomination Period – Begins Monday, October 2nd at 8:30 a.m. and ends Monday, October 9th at 4:30 p.m.
All Candidates’ URSU Q&A – Tuesday, October 10th 12 p.m. to 4 p.m.
All Candidates’ Meeting – Tuesday, October 10th 5 p.m. to 7 p.m.
Campaign Period – Begins Tuesday, October 10th at 12 a.m. and ends Sunday, October 15th at 11:59 p.m. Candidate Profile Deadline – Tuesday, October 10th at 4:30 p.m.
All Candidates’ Forum – Thursday, October 12th 3 p.m. to 6 p.m.
Voting Period – Begins Monday, October 16th at 12 a.m. ends Tuesday, October 17th at 11:59 p.m.
Voting Results Announced – Wednesday, October 18th at 12:00 p.m.